I just LOVE when you can add fun details to kids' clothes. 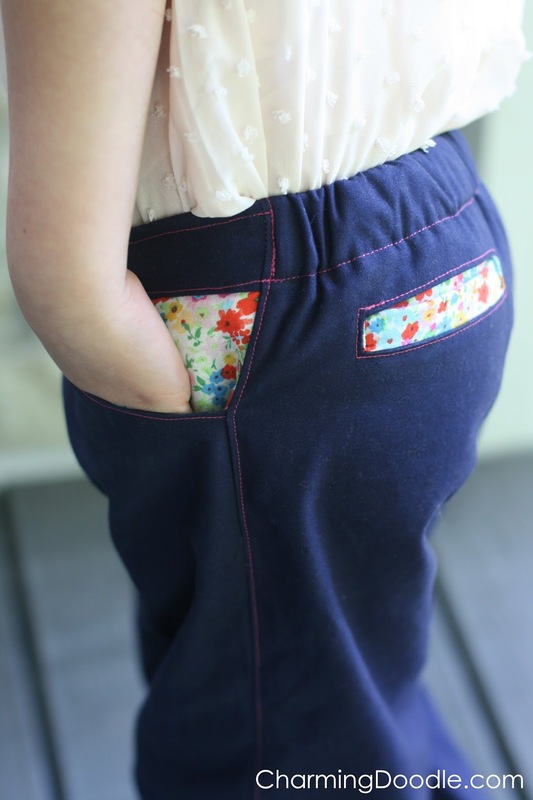 I recently made two pairs of Terra's Treasure Metropolitan Pants as a review for Fairytales, Frocks and Lollipops, one for a boy, and one for a girl. 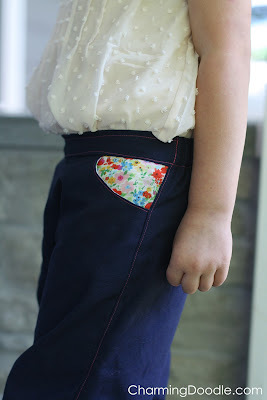 This is such a CUTE pattern and easy sew. If you've been reading my blog for a while you know that I have four kids (2 boys, 2 girls) and have only been sewing for about a year. When I discovered the world of pdf patterns I fell in love! I'm always on the lookout for new patterns and if a pattern can work for both my boys AND my girls...well, it's worth getting. 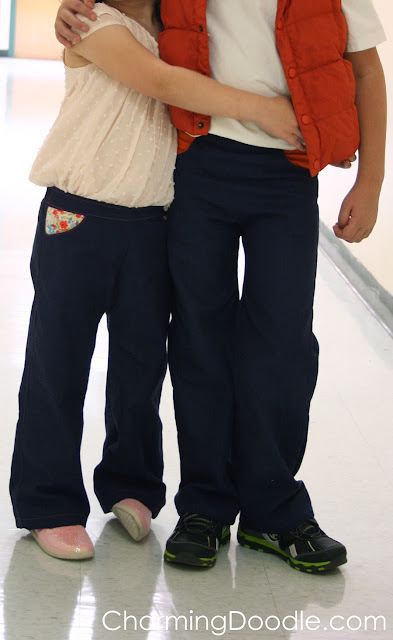 My two oldest are in 1st Grade and Kindergarten this year and they have to wear school uniforms. Their shirts have the school's logo and their pants/skirts/shorts can only be black, navy, or khaki. 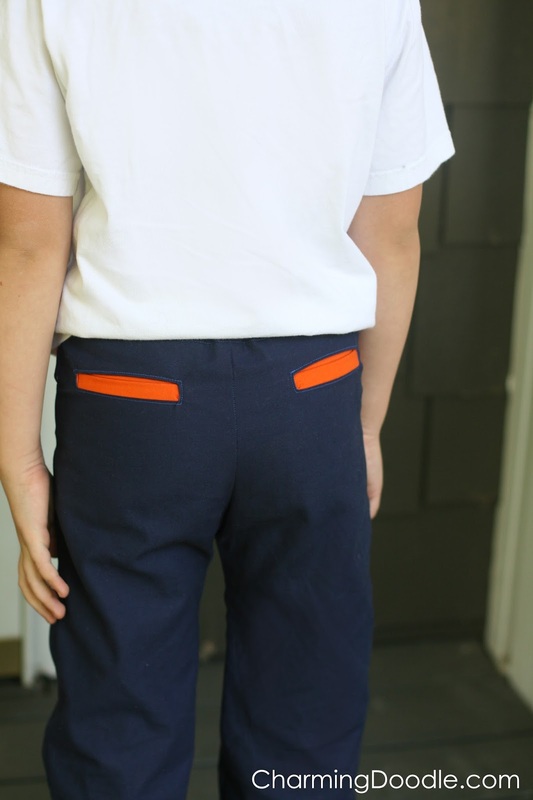 But the pants can have embellishments if they're small so I chose to give this pattern a try and add orange pockets (at my son's request) and flowered pockets to my girl's pants to make them a little less 'uniform-y.' The contrast fabric is the perfect punch to a pair of pants for them both. 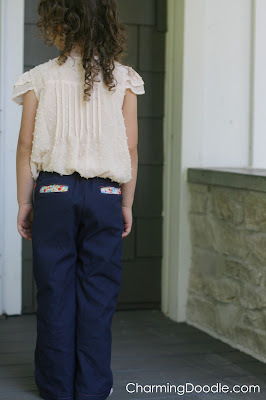 Overall, these pants are very easy and quick to sew. Any adventurous beginner can sew these and expert sewers can have fun adding unique details to this pattern. From the time I cut out the pieces to the time I was finished sewing (I made both pairs at the same time) it was about 2 hours. One pair would be even faster! The big challenge in sewing the pants is figuring out what size to make. There's no size chart with the pattern. I made a size 7 for my son but they are tight at the waist so next time I would make an 8. My daughter wears a 5/6 and I made a 6. It fits her well and there is even some room to grow. So if in doubt or if your child is between sizes in ready-to-wear, I'd make these in the bigger size. There are only a few pattern pieces to cut out and it's a bit confusing at first to determine which ones should be the contrast fabric for the pockets (if you make them with contrast fabric...you could just make them solid and they'd be cute too). If you want to use contrast fabric, you'll cut out the pieces shown in the second cutting layout diagram with your contrast fabric and the other three pattern pieces shown from your main fabric. I admit that I was a bit intimidated at first by the look of the welt pockets. I've only sewn welt pockets one other time but it didn't take long to get the hang of them. The instructions in the pattern are very clear and if you read it carefully and look at the pictures provided, you'll be a pro at welt pockets in no time. I finished my son's pants first and after they were done I wished I had topstitched them with orange down the sides of the pants. But I didn't want to pick them apart to do that...so I left them as is and decided to topstitch my daughter's in pink before I finished sewing the legs together. It was an easy detail you can add to give the pants some personality. I also made another pattern change to my daughter's. After making my son's pants I saw that the waist of these pants sits pretty high. I actually cut them down over an inch for my daughter. To do that, I just cut the front pieces shorter at the front waist and then made the pocket piece deeper so you'd still see the pretty contrast fabric. I did not cut the back piece down, instead I just folded it down more than the pattern calls for and my elastic casing was bigger. I plan on making these pants again in the future and will probably try to add a zip fly to them. The shape is really nice and the length is great so I think there's an endless amount of possibilities for these pants. And oh, the compliments my kids have gotten. It's pretty unique to have orange welt pockets for a boy and I'm often asked where I bought them. Little do they know that anyone can make these great pants. 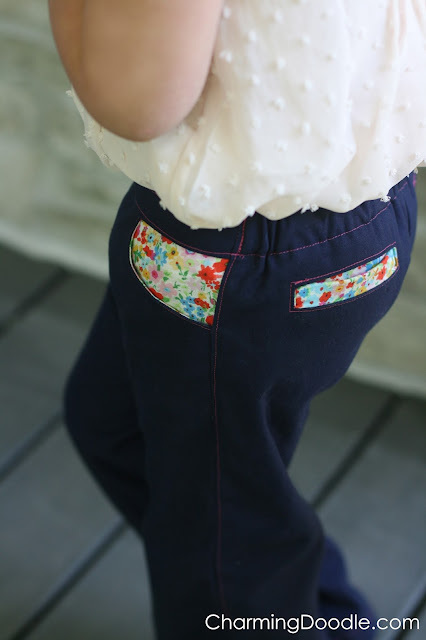 Be sure to check out the other tutorials I did as part of the Sewing for Kindergarten series. I made a Nap Mat, Round Pocket tutorial for a girly paint shirt, and a Book Bag Pocket.